Synopsis: It's been three years since theme park and luxury resort Jurassic World was destroyed by dinosaurs out of containment. Isla Nublar now sits abandoned by humans while the surviving dinosaurs fend for themselves in the jungles. With all of the wonder, adventure and thrills synonymous with one of the most popular and successful series in cinema history, this all-new motion-picture event sees the return of favorite characters and dinosaurs"along with new breeds more awe-inspiring and terrifying than ever before. It may seem difficult to believe, but when the filmmakers behind 2015's Jurassic World began its development, they had no idea that their labor of love would become one of the top-five grossing movies of all time. For Jurassic World director Colin Trevorrow, who also co-wrote the first chapter"and returns as co-writer and now executive producer of Jurassic World: Fallen Kingdom"the relaunch of the series that has captivated him since he was a boy has long been imagined as a trilogy. Alongside co-writer Derek Connolly, he has taken great pride in bringing the cautionary tales of Michael Crichton and world creation of Steven Spielberg to a delightfully dangerous and unexpected new level. Once the global press tour wrapped and riveted audiences celebrated this landmark achievement, it was time to take a deep breath…and then get back to work. "About two weeks after Jurassic World came out, I had been living in Los Angeles with my family for the year and had to drive back to our home in Vermont," recounts Trevorrow. "I asked Derek if he would ride with me, so we could use that cross-country trip to talk about where the story could go next. I had a very basic set of ideas I wanted to present to him"in a place that we could think freely and just get weird with what the future could be." Buoyed with confidence at the film's rip-roaring success and Spielberg's confidence in their narrative arc, the pair hit the road to discuss what was next for former raptor trainer Owen, operations manager Claire and the thousands of displaced dinosaurs roaming the land and flying above Isla Nublar. "This time around, Steven said, 'Show me what you think this can be, where you think these characters should go and where we should take them,'" shares Trevorrow. "So we drove to Vermont and, on the way, came up with the story that is Fallen Kingdom." While Jurassic World took the park that was only a promise and brought it to awe-striking, terrifying life, Trevorrow knew the next chapter could and should tackle much darker themes. The storyteller who first made a splash with the celebrated Safety Not Guaranteed has long been curious by what it means to exist within paradoxical time. "These dinosaurs were of this Earth 65 million years ago, and now they're in a place that is completely foreign to them," he says. "I thought there was a way we could tell a story that would identify the human angle. How would you feel if you were brought into a world that you didn't belong to…just for the satisfaction of others? That was a realm we hadn't gone to before, and it was something we knew these movies would benefit from." As the writing partners designed this second act, they strategized where they could take the audience. Through the greediness of investors playing God and park guests throwing caution and cash toward reason, Jurassic World had been unceremoniously obliterated. The writers knew there was fertile ground to explore off island, and they'd been quietly planting the seeds for years. "What would be the result of that destruction; what would be the step beyond it?" asks Trevorrow. "Fortunately, there were a lot of clues we planted in the first movie; in the film itself, on maps and on the website"in places people wouldn't think to look for hints about the next two movies"there's information embedded in all of them." Few characters are closer to Trevorrow than Claire Dearing and Owen Grady, the fiery former lovers who are seemingly destined to pine"and grouse"after each other from afar. Discussing how the heroes have evolved, he notes: "We thought a lot about where Claire would be a few years later, and how she'd have a lot of guilt, regret and responsibility"which she would take and put it into action. Claire knows there's a natural disaster that is about to occur on the island"one that has posed a question to the world: 'Do we let these animals die, or do we save them?' She's the person who feels the most responsible for rescuing the dinosaurs. "On the other side, we have Owen, who is responsible for proving that raptors can follow orders. He knows there is a capability for them to serve the same purpose as animals that have been used throughout history for war," Trevorrow continues. "That opens its own Pandora's Box. We have these two characters who are the mother and father of the new world. They're the parents of this slowly building biological disaster begun by John Hammond. It was important for us to find a way to weave Hammond into the story and to connect them together, as well as tell more about the history of how Jurassic Park began." The extraordinary dinosaurs are as much players as Claire and Owen. Nowhere is this more evident than with Blue, the Velociraptor to which Owen has had a deep connection since she was a hatchling. After a fierce battle with littermate Echo"one that left Blue with a scarred lip"she established her dominance among her pack. Once Owen pretended to be injured during her training, Blue showed her capacity for empathy. A virtual enigma among dinosaurs, she is equal parts vicious and nurturing; sadly, in the post Jurassic World era, she is also last of her kind. For the writers, it was crucial to bring back this fully fledged creature to which we have all grown quite attached. That storytelling level was extraordinary in Spielberg's eyes. "Blue has become a real character that we have imprinted on," he reflects. "In the first movie, John Hammond liked to be around every birth, every hatchling, because he wanted the animal to imprint on him. In this case, the audience has imprinted on Blue, which allows Blue to become a major character that we really care about in this second film." It was crucial to the narrative to open the series up and introduce a new set of dinosaurs from multiple epochs. From a Baryonyx and a Carnotaurus, to a crazy little bull-in-a-china-shop called a Stygimoloch, the writers brought more colorful creatures to Fallen Kingdom than ever before. As if it that wasn't enough, they imagined a genetically designed monstrosity known as the Indoraptor. Its DNA an unholy mix of Velociraptor, Indominus rex and who knows what else Dr. Wu spliced into its codons, this creature is not deadly because of size"it's due to his intelligence, speed and ability to follow orders…when he so chooses. Indoraptor is, without a doubt, the perfect weapon. There will never be a Jurassic film without our star T. rex, if the filmmakers have anything to say about it. "The T. rex is also back," Trevorrow shares. "We've been following this same character since the beginning; she's the same T. rex that was in Jurassic Park and in Jurassic World. She is iconic"not just because she's a T. rex, but because she's this T. rex." When it came to the next chapter of the trilogy, the producers turned to acclaimed Spanish filmmaker Juan Antonio "J.A." Bayona to join their quest. Known for work as deeply intimate as it is sweeping in its storytelling, the director was eager to join a production that would be his biggest challenge to date. We begin as Bayona recalls memories of the epic that started it all: "Like many people of my generation, there was a sense of wonder when I saw Jurassic Park. There is something absolutely engaging about creatures that inhabited our planet millions of years ago, and the idea of bringing them back from extinction is fascinating. It is as playful as it is genius an idea for a saga. The first time I saw the Brachiosaurus on screen, I knew that everything was possible." That, and it is quite difficult to say no to the man whose name is synonymous with summer blockbuster…and indelibly linked to sense film memories. Bayona recalls a particularly good day: "It was Steven Spielberg who offered me the opportunity, and I feel blessed to be working with him. I admire him profoundly. Also, having shot The Impossible, The Orphanage and A Monster Calls, the opportunity of an adventure movie felt like a lot of fun for me; the timing was perfect." Bayona appreciated that Trevorrow, whose years-long passion is all-things Jurassic, was willing to partner with him in bringing the new installment to the big screen. "Colin pitched the story for this second episode in a trilogy, and that got me so excited," the director relays. "Since that day, we have been working together to incorporate my vision. I love playing with suspense to engage the audience; I like intensity and making people feel the total experience." Always humble, Bayona welcomed the opportunity for collaboration. "When I came aboard, I knew I was to take care of Steven and Colin's baby. As a director, I can contribute a lot of things to the story, to the energy and to the tone. However, I'm also aware the Jurassic saga is loved by millions, so I it was important to work closely with them to ensure we are bringing the audiences new, exciting experiences…while keeping the soul of the franchise." Bayona states that the imagination of his younger self was ignited by the prescient genius of Dr. Crichton. "What I always loved about Michael Crichton's books is that, apart from making you enjoy a great big adventure, they make you think about moral repercussions of the advancement of science. It is not science-fiction anymore; the reality of these advancements gives an audience immediate empathy. Twenty-five years ago, the debate about the moral limits of science was just beginning; today it is daily news. Colin and Derek knew we needed to be talking about this, and it makes our movie extremely relevant." Bayona and Trevorrow worked closely throughout production, and both men were open to having their ideas tested and retested by a fellow director. "It is a unique scenario, and I'm very proud of the way that J.A. and I were able to collaborate," reflects Trevorrow. "To be able to have two filmmakers"who are inherently visual"constantly trying to embrace the other's idea has resulted in something special. J.A. and I are very different, but I believe the result of what we've done is entirely unique. He has an innate sensibility for the elements that make Jurassic movies work. He has a spirituality to his films and a sense of family…but also families going through traumatic experiences together." Spielberg appreciated that Bayona was able to dovetail his signature voice into a universe that has a distinct style of its own. "One thing that the films in the Jurassic series have in common is that they are created by filmmakers who love the craft of filmmaking," reflects Spielberg. "Juan Antonio did an amazing job through his art in being able to make Fallen Kingdom a little bit like the first movie I directed, a little bit like the last movie that Colin directed…but still make it 100 percent his. Because he's a real filmmaker who has a real voice, he found a way not to hijack and change the tone or mood or style of Jurassic Park, but a way to make this his own Jurassic World film. We were blessed that he brought his voice to our series. He's just knocked it out of the ballpark." For veteran filmmaker Frank Marshall, who returns to produce, the dynamic appeal of this partnership was a no-brainer. "Colin and Derek have taken elements we are familiar with and pushed them to a new level. This film has such huge scale. We begin in the park itself, on this vast environment with volcanoes, as well as underwater and within escape-sequences. Up until now, humans and dinosaurs have been separate. In Fallen Kingdom, we see a lot more interaction. We've brought back Blue, Mosasaurus, T. rex and others you will remember, plus a lot of new dinosaurs you've never seen before." Marshall appreciated that Bayona could bring to the project a sensibility that was unlike anything the series had seen: "J.A. has a wonderful, cinematic vision in which he creates incredible worlds and wonderfully succinct characters. It is not just about the dinosaurs, it is about the characters. He brings a vision and excitement to the characters as they pass through Jurassic World." Inarguably, the biggest stars of any Jurassic film are the stunning dinosaurs, an elegant brainchild of top artists working in their respective fields of animatronic creatures and visual effects. "We have surrounded J.A. with highly experienced people who have a done a great deal of large-scale production," gives Marshall. "ILM worked very closely with him; they always push the envelope on technology, and it is exciting to see the new toys we have in our toolbox to create these scenes with the dinosaurs. We also have Neal Scanlan, who has imagined wonderful creatures over the years, creating our animatronics. Fans enjoy our use of real creatures and for the actors, it is great for them to interact with an 'actual' dinosaur." Patrick Crowley, who returns alongside Marshall to produce the new installment, speaks to the solid foundation and caretaking that benefits the franchise. "The key element we have going for us in this trilogy is the involvement of Colin Trevorrow and Steven Spielberg. Steven is the grand master, in charge of making sure that what we do reflects the original intentions and carries out the themes that he set up a long time ago. Colin, Steven, and now J.A., understand the responsibility of upping tension and danger. This movie is full of things people haven't seen"places, dinosaurs that have never been on screen, and brand-new experiences." Crowley lauds that his director has given the established franchise just the energy boost that everyone needed. "The Impossible was the experience we all felt made J.A. a worthy candidate do this movie. We knew he could handle the scope and scale. He had a tiny budget, but his specialty is creating tension and bringing the same feeling to a Jurassic movie that Colin brought to Jurassic World." For Crowley, a Jurassic movie would not be complete without an abundance of speciation. It's also a source of pride to the crew to outdo itself, without dwarfing the narrative. "In this movie, you will see more dinosaurs than you've ever seen before," the producer proclaims. "You will also see dinosaurs much closer in proximity to human beings. It's a very unique feeling, involving totally different action. We spend a lot of time with Blue, who is the film's heart. We also have a brand new dinosaur called the Indoraptor, who is a genetically modified creation of Dr. Wu. He is smart, incredibly physical, can move like a lizard and get into places other dinosaurs were too big to get into; he is really, really nasty." This scientific miracle/abomination was a particular delight to Spielberg. He laughs: "This is the first Jurassic movie that I could truthfully say where we have a monster. The Indoraptor is a dinosaur, but it's really a monster. That makes Fallen Kingdom the first real hybrid between a dinosaur film and a monster movie." For her part, producer Belén Atienza, Bayona's right-hand filmmaking partner, was thrilled to join the group of seasoned filmmakers on this journey that's been 25 years in the making. When discussing their experience of working on Jurassic World: Fallen Kingdom, her attitude echoes Bayona's boyish sense of wonder. "It felt like we were kids again because it reminds us of our childhood," she reflects. "The wonder of dinosaurs, the adventures, jungle, mysteries, action and suspense was just astonishing." That energy would prove infectious on set. "From the very first moment we began to work on this project, it was all about how to squeeze every moment we could out of the film and bring it to the audience." Producer of all of Bayona's features, Atienza shares a kindred spirit in executing engaging stories. Of the process, she graciously notes: "The vision starts on the framing of the scene. It is all about the shot and work that's been done months in advance: reading the scene, working out the shots…every camera move, speed and time you spend on each character. On the day, there will be input from actors and other filmmakers, and we are always open to that. Once you know what the scene is about, then it is all about making it better." Speaking to the style Bayona has honed over the years, she notes that Fallen Kingdom's director is equal parts disciplined workman and mischievous storyteller: "He is always trying to find something special. That is why there are playful sequences in all his movies, where you don't really know what to expect next. He wants three or four beats from every shot; it is quite complex, like a technical choreography that is instinctive in him. At the same time, he is an artist who is incredibly invested. It is a joy to see him work." It's impossible to think of a return Jurassic World without the electric pairing of Claire and Owen. "Everyone loves that couple so much," Bayona states. "The chemistry between Bryce and Chris reminds me of classic Hollywood movies. We had to go back there. Chris created an amazing character, providing Owen with genuine charm and comedy. He has an honest inner strength that somehow communicates to the audience that he will always do the right thing." Pratt shares what about this series continues to resonate with audiences: "The success of Jurassic World starts with the success of Jurassic Park. The original movie is just so beloved. It captured the imagination of an entire generation, and there was a world hungry to see a new version of this story…one with all the technological advancements that have been made in filmmaking since 1993." Working with Bayona proved a rewarding experience for Pratt. "J.A. is a huge movie buff," the performer says. "He particularly loves a movie with an edge, and he's bringing that to this film. He is playing, not so much with what is there but what might be around the corner. These movies are all about science, imagination and suspense. J.A. 's a master." Very few in the Jurassic world can understand the brutal physicality of one of these films, so Pratt appreciated the chance to collaborate once again with Howard. "I'm teamed with Bryce, who has an incredible work ethic; she is passionate about every step of the process. Combine that partnership with our director's vision, and we've got a pretty good handle on what we need to make this the best Jurassic adventure it can be." Claire and Owen have been living separate lives, but are reunited for a common goal. While she has made it her mission to protect and save all the creatures, she knows that what will get Owen back on the island is the chance to rescue Blue, the Velociraptor to whom he has the closest connection. "Much of what's happened between Claire and Owen is unspoken, but they've gone through traumatic experiences together at Jurassic World and have each handled that differently," reflects Pratt. "Owen believes there is no way to make yourself feel better; you have to move on and live your life. To bury yourself in guilt like Claire's done is wrong, and for Owen to ignore what they've gone through is also flawed…so they need one another. You see that these characters are drawn to one another and destined to be together…but circumstances have not allowed that to happen." Pratt's role required a great deal of stunt work, and there was many a night after filming that his bruised self fell into a deep sleep. "This is more physical than the first movie," Pratt says. "There were a lot of stunts; I've rolled out of the back of trucks, gone diving, ran down mountains and did underwater stunts. We've also got huge fight sequences. They've taken the action-hero element that worked in the first movie and quadrupled it." Filmed in the underwater tank at Pinewood Studios, the sequence took five days to capture. Pratt explains: "I loved the whole underwater sequence. The creative concept was to film it in one shot, keep the focus as though we are inside the gyrosphere looking out. We never cut from that point of view, and this thing is sinking. Claire and Franklin are about to drown and Owen must swim down to break them out, but it doesn't work. Owen must swim back up to the surface, then come back down. All this had to be done in elements, and it was like putting together a thousand-piece puzzle. I loved the process of shooting piece by piece and watching this thing become stitched together." As Owen, Pratt has taken a pack of Velociraptors on a chase through the jungle and survived the vicious teeth of countless other creatures on the island. But nothing could prepare Owen for the monstrous new dinosaur created by Dr. Wu: the Indoraptor, the most deadly creature to ever walk the planet. "The Indoraptor opens the story up and gives us a hint at what the future holds for the Jurassic franchise. You get the sense the Indoraptor is what the end goal was for InGen. They have been developing this type of intelligence and cognitive design for raptors for years. The latest development, the Indoraptor, is essentially bulletproof. It attacks on command. It has been designed as a deadly weapon of war and we see first-hand just how dangerous it is. The prospect of these creatures in the wrong hands is terrifying." 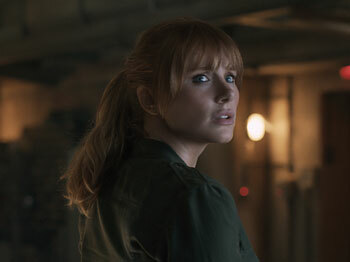 Bryce Dallas Howard returns to the role of Claire Dearing, a character who, like Owen, has been irrevocably changed by the disastrous events of three years ago. "In Jurassic World, Claire goes on a very clear arc," reflects Howard. "You see who she is on the exterior, but you don't know who she is on the inside. By the end of the first film, you know what this person is really made of and can clearly see who she is." While Owen retreated into a life of solitude, Claire has done the complete opposite"creating the Dinosaur Protection Group (DPG), whose mission is to save the dinosaurs remaining on Isla Nublar. "She is still dealing with the fact she needs to take responsibility for everything that happened," Howard continues. "She made a mistake she can never take back because she was a part of the creation of the Indominus rex; she wrote the check for that. Now the world is a different place because of her actions. She opened Pandora's Box, and she can never close it again. All that Claire wants to do is be on the right side of history. It's her cause and mission." Howard wanted to imbue her character with layers that are far-too-often absent in female characters in action films. "They will be a damsel in distress or a strong heroic woman, and there's no in-between. What I love about Claire is that you don't necessarily like her all the time, but you relate to her; you understand her and believe the fight in her. Getting to play a woman who is determined and focused, while also at times being clumsy and self-righteous, is exciting because that's a human being." Echoing Trevorrow and Bayona, Howard underscores that source material is crucially important to her; to that end, she drew choices for her character from Crichton's cautionary tales. "I've read a lot of Michael Crichton's novels, and there are identifiable themes that run through all his writing. Like any iconic sci-fi writer, he was preparing us for the future. He was preparing us emotionally so that we can make the right choices based on our own humanity. These are the questions Claire is dealing with: Is the humane choice to save the dinosaurs, or is it better to let nature take its course and allow the dinosaurs be destroyed?" Howard was enthused that her director is just as passionate about these topics as she. "J.A. is an incredible filmmaker and genius when it comes to frightening people. He just understands suspense, particularly with creatures and monsters. Often, what's so frightening is when you don't see the monster until the very, very last minute. Just at the right moment the monster is exposed in a way that will haunt you for the rest of your life…but you love it. He is a hard-core cinephile and someone who has reverence for the greatest visionaries in storytelling history. He is part of a team who is creating the next chapter of this story together." Although Howard has been acting in films since she was a child, her director's ability to surprise continued to impress her throughout production. "There are a couple of things that J.A. did on set that I have never experienced as an actor before. We'd shoot scenes without dialogue, and he would play music, which informs absolutely everything. We would walk differently, even behave differently. He also had a lot of dinosaur sound effects. Suddenly, there would be a really loud roar out of nowhere; it scared us and got a reaction. He uses these tools to bring us into his world so we are all in sync"all part of the same orchestra." Bayona wasn't the only one attuned to the fact that production had to be harmonic. As Howard reunited with Pratt, she reflects about his keenest of instincts: "Chris just knows the absolutely most fun thing that can happen in a Jurassic movie. When we're in a scene together, and I see Chris moving, I'd say, 'Guys…Chris' Spidey sense is tingling.' He knows what he would want to be watching, and we feel like kids when we're on this movie set. You haven't experienced fun until you've acted opposite Chris Pratt in a Jurassic movie." Like co-star Pratt, Howard shared in the fear of all things Indoraptor. "We know the rules in terms of how you survive certain dinosaurs, but the Indoraptor is an entirely human-made monster," the performer notes. "What is so terrifying about this creature is that we don't know how to survive against it. If you stay really still, the T. rex won't be able to see you, and there is the possibility of escape. Now this dinosaur is a game changer. Dr. Wu has created an unstoppable weapon. But here's the twist, you would think the scariest thing that could happen in a Jurassic movie would be facing a dinosaur. What we see in this movie is that there is something far more menacing and evil"something more bloodthirsty and ruthless"mankind." Naturally, Claire's much discussed style from the first chapter has also changed along with her new world view. "That haircut and the white impeccable suit from the first movie represented a certain kind of person, who Claire was," sums Howard. "In this film, I wanted to show right away that she is dramatically different. Claire is a sensible, intelligent woman who is well prepared." She laughs: "I'm now wearing really sturdy boots, and I'm very happy about that." Joining Howard and Pratt are two performers who have been a part of the Jurassic family since day one. BD Wong returns to the role of Dr. Henry Wu, creator of the abomination known as Indominus rex. After devouring its only sibling, the Indominus rex, whose genetic makeup was classified, reached maturity just in time to take down Jurassic World. Wong explains his character's current position…in the years after Masrani's investment fell through: "Dr. Wu has been called out for bad ethics, so he is not on top of his game anymore. He still has the same knowledge, but he is more desperate and doesn't have the same kind of mechanism under him. He is in very different circumstances, and his hands are really tied." Still, where there is a brilliant, mad scientist, there are always investors. Wu is working on a new genetically modified creature, an animal far more terrifying and intelligent than the T. rex or the Indominus rex. "Dr. Wu is always creating a new dinosaur," the performer laughs. "Although, I would say his intentions are not terribly malicious. He turns a blind eye to a few things for the sake of the glorious technology he is pushing forward, but he really cares about fashioning the dinosaurs in such detail that they can be controlled. The age-old argument about how long that would take, and whether it is morally the right thing to do, is part of the movie." Dr. Wu's secret lab is revealed in this chapter, and Wong was delighted with the design. "This set takes the idea of Dr. Wu's secret lab to a whole new level. The room that we see at the end of Jurassic World pales in comparison to the operation that is going on down here in this massive subterranean lab. In my acting career, it is only these movies where I get to work on this kind of set. It pushes to the wall of the very sound stage. It is extremely detailed, authentic and appears no expense has been spared." The Indominus rex was only the beginning of taking genes from a dinosaur that already existed, cloning it and cross breeding with another species to create something more awe-inspiring. "The Indoraptor is a great super-villain for the movie," shares Wong. "As the creator, Wu is somewhat conflicted about the incarnation because, to his mind, the Indoraptor is not finished yet. He would like to continue to draft it until perfect. Everyone else just wants to take the Indoraptor and use it because it appears to be fully functional, but it's not." Jeff Goldblum bookends the movie as Dr. Ian Malcolm, a character immortalized by the original Jurassic Park. "Besides being very entertaining, this franchise does point out some of the issues of the human species today with some relevance," Goldblum offers. "My character has always spoken out against that: He didn't like the idea of animals being exploited for entertainment or money-making. In this movie, the villainy is tied in with capitalist greed and general stupidity. Those are a couple of Ian Malcolm's favorite subjects." After the disaster that occurred in the theme park, the island's volcano threatens to wipe out the population of dinosaurs remaining on Isla Nublar. "There is a debate going on, and Malcolm is brought to Washington, D.C., to speak in front of the Senate committee on the issue. He believes we adverted the course of natural history. We interfered and manipulated, and we did it for the wrong reasons. Dinosaurs are still a bad idea and as long as the volcano is going to take them out, we should allow it. If we try to move them, it is going to end in disaster." Discussing his partnership with Trevorrow and Bayona, Goldblum is complimentary. "As I was working on the part, I got some ideas and called Colin. We had a good hour-and-a-half conversation exchanging our ideas. J.A. is also very sweet and trusting. He is passionate and serious, not just about making a great movie, but articulating the issues of the misuse of science and bad ethics voiced via my character." Their director was thrilled to have both men rejoin the team. "It is great to have the couple that we all love so much, but it is as exciting to bring back some familiar faces," commends Bayona. "We have Dr. Wu returning, and it is great to have Jeff playing Ian Malcolm once again. To my mind, he is one of the most charismatic characters in this saga, and to have him playing a role in this movie is incredible." "I knew that I wanted Ian Malcolm in the film as somebody who would be the best authority to say, 'Look at this. I told you this would happen, and sure enough it has," adds Trevorrow. "I wanted to make sure that he bookended the movie, so that he was able to set up all of the ideas that we're exploring. It's exciting because most of the dialogue Ian Malcolm has in the Senate hearing is straight from Michael Crichton's novel." Legendary performer James Cromwell plays Sir Benjamin Lockwood, the wealthy ex-business partner of John Hammond. He introduces his character's position in the latest instalment: "Lockwood and Hammond were partners and great friends. Together, they developed the technology to bring these dinosaurs back from extinction. Hammond and Lockwood drifted apart, which was unfortunate. What happens in the story is my way of trying to make amends by facilitating what he would have wanted to happen to these dinosaurs." A lifelong animal-rights advocate, Cromwell was impassioned by the story Trevorrow and Connolly were out to tell. He underscores: "The usurpation of other sentient life for our own purposes, whatever they are, is an important issue. We do not have a right to determine the value of that life. There is a price put on every living thing, and that is deplorable. We are to be guardians, to take care of those creatures that need to be taken care of and to leave those alone that do not need to be taken care of." He pauses, "Of course, we have been violating that since the first Homo sapiens stood up." Rafe Spall plays Eli Mills, controller of the Lockwood Estate and the man whose purpose it's long been to give dinosaurs a safe place to live. For the performer, the history and appeal of the franchise has never waned. "I've never met anyone who didn't like Jurassic Park, and it remains a perfect film. The simplicity of the water shaking is master filmmaking. That was at a time before we had the expanse of digital power to create all kinds of different monsters, explosions and huge set pieces. Getting someone like J.A. to direct this movie is fantastic because he is a master of suspense. To have both those elements, the classical suspenseful filmmaking style of J.A. with the might of the digital animation now available, is an exciting prospect." In Fallen Kingdom, Spall's character makes some questionable choices. "J.A. and I talked a lot about ambition, greed and the pursuit of power"how all-consuming it can be and that it is a huge engine," the actor notes. "Ambition is such a powerful emotion, you can get wrapped up in it and end up doing things in order to succeed. This character believes he is doing right. He has been entrusted with pushing Lockwood's fortune into the future and making it survive after he dies. Mills feels he is simply doing what he was asked to do." Newcomer Isabella Sermon portrays Maisie, the young granddaughter of the billionaire. Producer Crowley tells us a bit about her place in this world: "It's always been great to see events through the eyes of a small child, one who doesn't know much about what the dinosaurs or the adults are doing. We've created this character who's shrouded in mystery. She is a 10-year-old girl played by Isabella. We interviewed approximately 2,500 girls and chose her. She is really remarkable, smart as a whip and is tenacious." The young actress gives us a look inside where we find her character, and the creature who is singularly focused on getting to her. "The Indoraptor is a horrible and extremely clever dinosaur," says Sermon. "It was designed to be used as a weapon but it is completely out of control. In one scene, I'm running way, and I back down a corridor and feel something in my hair…it is the Indoraptor's claw. Shooting that scene was quite hard at first because I wasn't supposed to know there was anything behind me, but it was quite scary. The prospect of a massive claw sitting there waiting for me was hard to ignore." Sermon's character is involved in some of the biggest action sequences in the film, especially when Claire and Owen are trying to rescue her. "There is a big stunt where Maisie slides down a huge glass roof," shares Sermon. "It was hard to begin with, but then we progressed to going down head first, which was fun; now it looks awesome!" Howard admits that she quite enjoyed working alongside the newcomer. "When I'm working with a young person, in particular someone like Izzy who is a remarkable talent, I know that she is going to be truthful because she doesn't know how to be anything else. Izzy doesn't have any bad tricks or habits picked up along the way. I try to steal as much as I can from her because she is so good." Justice Smith, who tackles the role of DPG computer tech Franklin, he talks about what the franchise meant to him growing up. "The original Jurassic Park movie came out the year I was born. I remember watching all the movies with my family whenever we would take road trips. We would have a DVD in our van, and we'd watch all the films in order. I remember loving them because I liked horror and thrillers. They hit the right spot." As the computer genius working for Claire's Dinosaur Protection Group, Franklin thinks he can do good while staying in the comfort of his own home. "When Claire goes to Isla Nublar on a mission to protect these animals from the volcano, I have to go to because the tracking devices in the park need to be reinstated," Smith explains. "He does not want to be there, and is so riddled with anxiety it's funny. Throughout the course of the movie, he learns how to come into his own by facing death and tribulation repeatedly." As serious as the story can get, there was time for a bit of fun on set, especially when it came to be chased up an access ladder by a Baryonyx. "J.A. thought it would be a good idea to unsettle me a few times," laughs the actor. "In order to get a genuine reaction, he played a T. rex roar over the loud speaker to scare me in the middle of a take. Then, during the volcanic eruption, the chairs had something on them to make them vibrate; that scared the life out of me as well. It's great for my character because I'm just on edge the entire time." He adds, dryly, "J.A. thought it was very amusing." Performer Daniella Pineda went on a research mission to gain an understanding of how her character, Dr. Zia Rodriguez, a former Marine and paleoveterinarian, would handle herself in this brave new world. "Paleo-vet is something completely new to the franchise," she explains. "I spoke in great detail with my dog's veterinarian about working with syringes, etc. Additionally, we had a number of specialists on set"one on wild alligators and a consulting veterinarian who has done a great deal of work with wild reptiles. For example, reptiles have incredible immune systems because they're ancient beings; you don't need to use sanitizer, you can just sew them right up! Every little detail I could pick up along the way really helped color my character." It's no coincidence that Zia reminds audiences of Dr. Ellie Sattler, who used her paleo-botany skills to administer help to the ill triceratops in Jurassic Park. One of Zia's hero moments in this chapter is when Blue is injured and all eyes are on her to save the Velociraptor's life. Pineda recalls filming day: "I didn't sleep the night before. Not only was it my character's big scene, but the task at hand felt so real because the dinosaur I was operating on was an animatronic creature; it looked so realistic. It felt like I was actually operating on a real animal." The actress echoes her fellow cast when it comes to sharing stories about collaborating with their director. "J.A. knows exactly what he wants, and working with him was an artistic pleasure" she reflects. "He is incredibly technical but at the same time, he is an artist and approaches everything with love and truth. While I was operating on Blue, he incorporated wonderful music and told me to slow down and take my time. Often directors are telling you to pick up the pace, speed it up, but that was never the case with J.A." Toby Jones joins the cast as the manipulative Eversoll, who sees the magnificent creatures as merely a commodity. "It is safe to say that my character is interested in money and the profits to be made from generating new dinosaur breeds," Jones offers. "In a way, he is like a rogue arms dealer; he sees profits in selling these creatures as weapons. He is totally morally neutral about whatever he is selling. He is only interested in whether or not it will make him a profit." The multitalented performer admits characters with questionable morality are those whom he most relishes bringing to life. "I enjoy playing people like that who are completely compromised." The scenes involving Eversoll were filmed on some of the enormous sets built at Pinewood Studios in England. Jones recalls the scale and detail: "It was extraordinary, the care and attention that had been paid to each exhibit"and similarly with the costumes, makeup, wigs, everything across the board. You're aware that people are taking care of every single detail in a very fast-paced, action-packed movie. When you walked on to the huge hall of the Lockwood Estate with the dinosaur exhibits, it was like walking into a natural history museum." The voice of authority and loving character of Maisie's life is Iris, her nanny. Played by acclaimed thespian Geraldine Chaplin, Iris looks after both the young girl and Lockwood. According to Chaplain, "She loves Maisie and would die for her." Chaplin has appeared in every one of Bayona's features and shares the history of their friendship. "Years ago, J.A. saw me in a trashy TV show and asked me to be in his movie. I read the script, and I could tell this guy was breathing cinema. It turned out to be a huge hit. So the next film, he asked me to join him in Thailand, and he wrote the most beautiful part for me. Then in A Monster Calls, it was the same thing. He gives me little bits in every film; he thinks I'm his good luck charm." The actress offers how being the daughter of the iconic Charlie Chaplin informed her start in the business, as well as her work ethic and compassion toward others. "My father was Charlie Chaplin and not only was he the most famous, most genius of all people in films"he was also the most loved"which is really important. When I first came into the industry, everyone wanted me to be good because my father was their hero. I was treated like a niece, daughter or granddaughter. They helped me, and it was thanks to their love for my father that my first steps into the industry were so easy." Renowned Oscar®-winning creature effects supervisor Neal Scanlan was brought aboard with the unenviable task of ensuring that practical effects dovetailed seamlessly into the film. He discusses the curious balance between physical and computer effects on a juggernaut project involving dinosaurs: "I'm going to surprise you and say that animatronics is not always the best way forward for every scene. You have to weigh up the pros and cons of approaching it practically. If there is a dinosaur on set, you can light it for real and the actors can interact…but you have to support that performance with the people behind the creature. "In some ways it will have an impact on your shooting schedule; you have to take time to film with an animatronic," he continues. "In the balance, we ask ourselves if it is economically and artistically more valuable to do it that way, or as a post-production effect. Once we have looked at each particular case, with the director and the VFX supervisor we decide whether"because of the environment or the circumstances"it is the right way to go practically. It is interesting dicing up the different techniques." Logistics be damned, Scanlan enjoyed the experience of seeing Bayona's reaction to the creation of the first Fallen Kingdom dinosaurs. "What I found with J.A. is that he is very trusting, which is always a great help when you first become involved with a filmmaker. When he saw the Tyrannosaurus at its true size, it was incredibly exciting. Although, of course, we'll never see a dinosaur for real, you have an immediate reaction to seeing this very real-looking creature in front of you." The creature effects team had a number of animatronic dinosaurs to bring to life, but none was more of a delicate dance than Blue. "We made a lying-down Blue, which is amazing to walk around. To see the size of the claws and know that once this creature walked this Earth is amazing," Scanlan proclaims. "As Blue is injured early on in the movie and is operated on by Zia, we had a vet come in to talk through the whole process of operating on a sedated animal. How one would approach that, not only from a procedural point of view, but also the types of tools that would be used, how the animal reacts to anaesthesia"and how there is still an awful lot of reflex action. This presented us with some dramatic moments to play with as well." What would a Jurassic film be without our infamous T. rex? "That is a lifetime ambition realized!" Scanlan cheers. "This is an amazing sequence, it's very dark and tense because the T. rex is sedated, and we have learned that sedated animals often have their eyes open. It is really eerie because, from the audience's perspective, they'll never quite be sure whether the T. rex is fully sedated or not…"
On creating the Indoraptor, he comments: "This is essentially a genetic experiment, and the idea is that it is not necessarily 100-percent successful. Our role with the Indo was to take the initial CG design and develop it further, with the scars and texture of the scales. Because this is a creature whose genes are drawn from many species, it does offer opportunities to explore and research these details. It is fascinating: the difference between something looking dragon-like, or crocodile-like or reptilian. For Scanlan's team, the mandate is the real language that exists in the natural world"something to which they had to be faithful. "At the same time, we have to be imaginative enough to allow the Indoraptor to be something different, believable yet grounded. This is not only in the form but the textures and how they might appear. Also, the genetic consequences of man intervening with nature, maybe this isn't as perfect a genetic blend as one had hoped, so it perhaps it has some degrading of skin, flaking of scales or some form of illness beginning to take place and be evident. All this gives the dinosaur his back story." In addition to crafting these amazing creatures, Scanlan's team is responsible for the performance of the animals. His team of talented puppeteers would bring the dinosaurs to life using a mixture of techniques. "Having a coordinated group of people who work together as a team to bring something to life through performance is the way forward for animatronics. Our approach with the dinosaurs was to try and operate them wherever we could through what we call 'raw performance' or 'direct connection.' Whenever we can get a performer to have their hands directly connected to the dinosaur, we will. If we can physically get our hands to touch and move something, then it is a direct connection between your heart and your imagination. For Blue, they had up to 12 puppeteers or performers who were only slightly off camera, almost inside the dinosaur. Bayona's team only used technology for the areas they cannot perfect with puppetry, for instance, blinking of eyes or the snarl. Like a magician, it's sleight of hand. They use every trick in the book to bring the human into the creature, or dinosaur in this case. Nevertheless, the advancements in technology have greatly benefited this hands-on approach, Scanlan explains. "In many ways, VFX has revolutionized practical effects. If you go back 15 years ago, and I wanted to put a rod onto a puppet to bring that to life, there was no way of removing that rod, it would have been in shot or we would have had to work out how to hide it from the camera. Nowadays, you can not only have a rod, you can have a whole person in shot and they can be removed digitally afterwards if the scene really demanded it. This does spoil us terribly, and CG has opened up this opportunity." Collaborating with the visual effects department to fill our screens with awe-inspiring dinosaurs is nothing new to the franchise. Scanlan explains: "They got very clever at mixing practical with digital. A sequence where you see four Velociraptors together, two are practical and two are digital and it is very difficult to tell which one's which because they swap them around. It was brilliantly done…the ability to mix two techniques and be clever about where and when to keep the audience guessing." This time, Claire and Owen get closer to the dinosaurs than ever before. 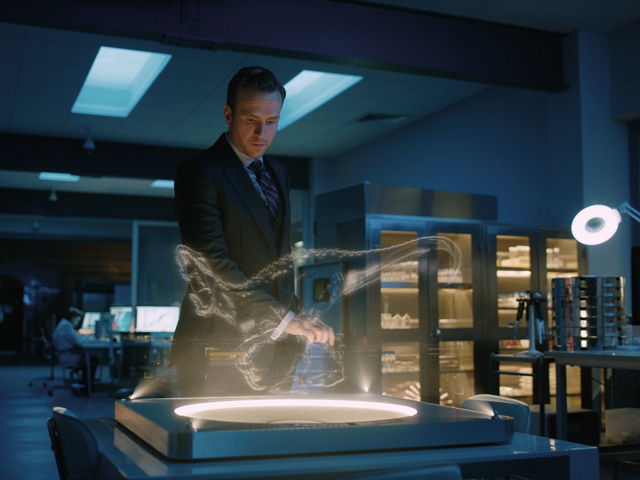 Howard discusses working with the lifelike animatronic creatures, particularly the Indoraptor: "There are five animatronic dinosaurs, as there are quite a few scenes where we're interacting closely with the dinosaurs, especially with Blue. To have the opportunity to have scenes in which you are responding to the performance of a dinosaur is incredible." "Jurassic World had one animatronic creature, the Apatosaurus, all the other dinosaurs were CG," explains Pratt. "On this movie, we have some real hands on interaction with the T. rex and Blue. To be acting, physically feeling, seeing, responding to these giant beautiful dinosaurs was amazing. The CFX team did such a great job, the animatronics are awesome. Claire rides on this drugged up, sleepy T. rex, and I narrowly escape its snapping jaws." Interacting with the animatronics was also a new experience for Smith. "It's been a blast; I have never seen anything like the raptor and T. rex before. The raptor had sweat: It drooled, blinked, and even had eye fluid. It was the coolest thing I've ever seen. It took 11 guys to operate it, and they were all huddled under the table making this creation move like a real animal. There are so many technical aspects to it that I've not dealt with before. Countless elements that I would never have imagined myself doing." Likewise, Jones talks about how the animatronics and reference dinosaurs helped to inform his performance. "It is interesting how useful it is when they bring in theatrical rather than cinematic toys to play with. When the puppeteers were on set with scale dinosaur tails or heads, you could understand what the final dinosaur would look like. It is a kind of irony that we are performing in a state of the art semi-computerized drama, but the thing that really helps you is a piece of ancient theater"like a puppet operated with full dedication by these model makers." For 25 years, Industrial Light and Magic (ILM) has been astounding Jurassic fans with its computer-generated dinosaurs. Visual effects supervisor David Vickery, discusses his team's ambitions: "While paying respect to the films that have come before, what we are trying to do is to create new cinematic moments that people remember; we want them to come away feeling like they've had a great time at the cinema." The challenges of blending realistic dinosaurs alongside their SFX counterparts might see superhuman, and they are. 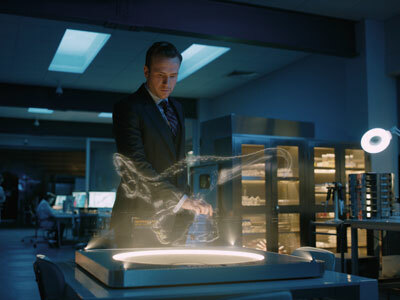 Vickery reflects that he takes his duties deadly seriously: "The moment people don't believe these dinosaurs are there, they get taken out of the film very quickly, and the experience is destroyed. We go into as much depth as we possibly can…to understand not only their appearance, size and movements but also the personalities of these animals and their characteristics. "We consult with palaeontologists and re-create anatomically correct models of the dinosaurs, from the skeleton up," he continues. "We need to see how the muscles connect at different points along the skeleton, and the way the ligaments and tendons are actually then fixed. We then add skin to the dinosaurs with a living flesh and a layer of subcutaneous fat beneath…then run very complex effects simulations to figure out movement. 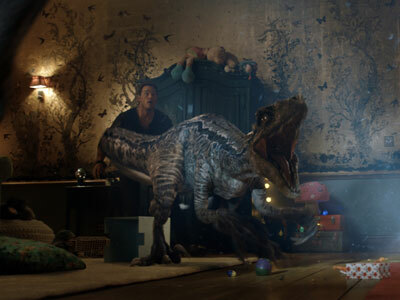 We've looked at elephants and rhinoceros to understand how animals with certain features move and behave. ."
As a good deal of the film's action takes place far away from the jungles of Isla Nublar, Vickery's team was tasked with ensuring that one could believe an Indoraptor was crawling into a child's bedroom. If Bayona does his job right, you'll be lulled into the nightmare. "These films pay homage to one another," the VFX supervisor sums. "At the start of Fallen Kingdom, you will feel very comfortable; you are in known territory, and it's like a warm cosy Jurassic blanket. But it quickly changes. We take the dinosaurs into new environments and spaces they've never been and explore how they would react to their unfamiliar surroundings." "The Indoraptor is a real character." Vickery says about our new "hero" dinosaur. "He is around 10-feet-tall to the top of his head, twice the size of the Velociraptor. He is slightly mentally unhinged, genetically imperfect, and a work in progress. There's things wrong with his brain; he's got ticks and twitches and is completely unpredictable. You'll see a dinosaur that looks like the Indominus rex or Velociraptor, but he can get down on all fours and walk like a quadruped, which is something we haven't seen in these types of dinosaurs do before." It is a matter of some pride that the production team has ensured that there are more dinosaurs in this film than all the other Jurassic movies put together. Naturally, Bayona's team is showcasing all species of dinosaurs from Jurassic World, including T. rex and Blue. While the artists have designed a whole new batch for this film, they're also bringing back some dinosaurs that appeared in The Lost World, and some that were only featured in Jurassic Park. For Vickery, the kid in him was thrilled. "It is exciting to bring all that together and update all the older dinosaurs with the new methods and technologies available to us on this one." As water is the bane of SFX, one of the most challenging dinosaurs for the VFX team was the Mosasaurs. "It's always easier if you shoot above or underneath the surface of water," sighs Vickery. "The Mosasaurs has a habit going up and below so we ended up shooting lots of large-scale practical elements. It seems odd to say, but our first port of call would always be to try and shoot something practically, get a real reference and then integrate them into the film with digital effects." Bayona has been keen to push Vickery's box of toys to the limit. "He is like a kid in the sweet shop," laughs the VFX supervisor. "He collaborates with all the people around him and leans on me to come up with intriguing visual ideas, creative ways to get interesting shots. It might simply be down to the way the dinosaur moves, and we start designing shots and they become pieces of action and beats within the film. Vickery and his team also worked closely with creature effects supervisor Scanlan. "There are quite a number of animatronic dinosaurs in this film, and there has been a direct and strong collaboration between VFX and CFX. One of the first animatronics they needed to build was a full-scale T. rex head and shoulders. ILM took the high-resolution models of the T. rex from Jurassic World and transferred the detailed texture maps to make them back into the three dimensional model. We sent that to Neal who then did a full-scale 3D print of the T. rex in sections, so he had an incredibly detailed, faithful version of the T. rex from Jurassic World. The results were fantastic, you can see every scale on her skin." Not only did the VFX crew have the seemingly impossible job of creating realistic dinosaurs. There was a little thing called a volcano erupting on Isla Nublar"one that explodes while Claire and Owen are on the island. An enormous amount of research went into creating emotive visuals for these scenes. "We have all grown up seeing pictures of the extinction of the dinosaurs in books, but I don't believe anyone has realized that on film"to this scale," notes Vickery. "It is an incredibly exciting opportunity to see these cataclysmic events happen on screen. We have consulted volcanologists to understand how a volcano of this type might erupt and the various stages of lava and pyroclastic flow. We are speeding it up a bit for the sake of our film, but it is definitely all based on real science." In Hawaii, Main Street of Jurassic World was re-built for the scene when Claire and Owen arrive back on the island and begin their search for Blue. The park has been deserted by humans, so is overgrown and destroyed by the events that took place three years before. Nicholson built part of the street but couldn't practically build the Visitor's Center in its entirety, due to its size. "This is where ILM steps in and creates digital set extensions to complete Jurassic World," the production designer says. "This time it is overgrown and run down. We are looking at the end of the park and it is quite a sad image to see it in disrepair; the dinosaurs have taken it back." There was also the small matter of a ship that had to be large enough to transport a number of fully grown dinosaurs. "The Arcadia is a fantastic example of where visual effects can help because it's a ship that doesn't exist. It's a boat on a scale that you'd never be able to dock on any coast of Hawaii, so the exterior of the ship needed to be completely generated in visual effects," offers Vickery. "Back in the U.K., Andy and his team built the interior of the ship's hold. This collaboration among the art department, prop makers, set builders, lighting and visual effects' teams ensured a seamlessness between the different departments' work. Audiences can just watch the spectacle and enjoy." For Crowley, one of the exciting things about making Jurassic movies is that the dinosaurs themselves get more interesting. "They're more beautifully realized," he shares. "There has been a lot of research and new evidence suggests that dinosaurs had brighter colors and beautiful bone structures. We all grew up with dinosaur toys that were grey, but now speculation is that they were far more colorful; so we've created amazing dinosaurs working with some of the best designers." It was a source of the pride for the team to add a number of new dinosaurs to this chapter. "People love to see dinosaurs that they didn't even know existed," the producer continues. "To make them credible we've gone to ILM who has been the partner on all of the movies. They are the best visual-effects house in the world. When you're watching the movie, you will feel that those animals are as real as any animal that you've ever seen." Enhancing the appearance of the dinosaurs in every way possible is high on the agenda, Crowley says. "We have Skywalker Sound, who has worked on these movies in the past. The sounds you will experience with our dinosaurs will make you feel as if you've gone back 65 million years and are listening to what's going on in the world that they lived in. We are getting the best anybody possibly can in terms of dinosaurs." When you're producing a movie on the scale of Jurassic World, you need to give the director a support network of right-hand collaborators to match the extraordinary tasks at hand. Crowley explains the process: "For J.A., all of his movies have been shot by DP Oscar Faura. J.A. 's relationship with Oscar is probably the most important on set because they have to think alike"to live inside each other's heads. We agreed to bring Oscar on to the show, and asked J.A. to look at a production designer we'd worked with in England named Andy Nicholson and costume designer Sammy Sheldon Differ." The Oscar®-nominated production designer, lauded for his work on Gravity, proved a flexible designer who was able to pull Bayona forward into a movie of this scale. "J.A. was able to get what he wants in a way that he never could have imagined before," Crowley states. "Equally, you want to give him someone in costumes who you feel will bring something special to this kind of a movie. J.A. and Sammy put their heads together and came up with the wardrobe for Bryce and Chris, which gives a look to the whole movie that's very special." Nicholson was faced with the challenge of creating a new world within the confines of an established franchise. Still, he appreciated the radical departure that the filmmakers were brave enough to take. "There is a very established look to Jurassic Park and Jurassic World, and this film is set in a very different context," Nicholson notes. "When we leave the island, it is a complete departure from what you have seen before. It's very refreshing. It was interesting exploring what that could mean, not just how the dinosaurs were leaving the island…but the place they were going." Much of the impressive scope of Fallen Kingdom is due to Nicholson's expansive set design and builds at Pinewood Studios in England, as well as his on-location work in Hawaii. "The scale is a by-product of the characters that our dinosaurs are playing, as well as the vast sets that the storyline requires," he reflects. Nicholson enjoyed collaborating with the creative mind of Bayona. "J.A. 's vision is unique and focused," the designer offers. "He spends a great deal of time thinking about what he shows his audience: the set design and framing of every shot. When I came on board, I spent four weeks in Barcelona with him going through reference pictures and ideas, as well as background detail and textures. We established a language and his ideas for the Lockwood house in particular; those were a lot of fun because of J.A. 's thoughts about color and texture." The Lockwood Estate"built in entirety on sound stages at Pinewood Studios England"reveals a history to the franchise that will be a surprise. The action is set over a number of the floors, with rooms including the vast library, state-of-the-art subterranean laboratory, the colossal containment facility, the smart office of Mills, and the bedrooms of Lockwood and Maisie. Nicolson discusses the evolution of the estate, and the flexibility of his producers and director: "The Library is a combination of what was originally two separate sets in the script. I liked the idea of having dioramas with dinosaurs, like natural history museums. I appreciated the passive control of nature and the color you get from that kind of display. It informs the room and says a lot about Lockwood. The addition later on of the dinosaur skeletons brought the room into becoming his private museum and collection, one based on his obsession with the creatures and his considerable wealth." Pratt admits that this set was one of his favorite layouts of the production: "Lockwood, in his passion and love for dinosaurs, has created a home that resembles the Natural History Museum," the actor notes. "This has been Maisie's entire life and it's a really cool, dangerous backdrop. There was actually a spookiness to it when we were filing the scenes in which the Indoraptor is chasing us through this place with its secret passages, cobwebs and creakiness. We've got really amazing practical sets on this movie, and I'm excited for people to see these awesome backdrops that juxtapose the dinosaurs." Another enormous set build at Pinewood was the interior of the Arcadia ship, used to transport the dinosaurs from Isla Nublar to their new home. "We had to come up with a type of ship that had a believable way of loading the dinosaurs quickly," the designer explains. "I looked at a couple of military options, and we settled on a specific type of dock-landing craft. The great thing about these boats is you can back them up to within 100 yards of the beach and drive them with pontoons. It's like a car ferry, but with a nicer feel because there is a big empty dock in the back. It had to be fast, so we added the slightly futuristic design of the fast attack vessels, as well as oil-rig servicing vessels and this large military ship. We used the ceiling of the stage as the ceiling of the boat, which gave us even more space inside the dock." In order to ensure these sets would be large enough for the scripted action, Nicholson pre-visualised all his sets. "The great thing about modelling sets in a computer is being able to play around with how the action will work. It is very important for projects like this because you have a way of addressing your questions in a relatively low-cost scenario. Someone can tell you a Velociraptor is X-feet long, but until you see it in the space, you can't appreciate what that means in terms of your set and the action that needs to take place within it." An unexpected consequence of returning to Jurassic World was that the filmmakers were able to explore other areas of the island that haven't seen in the films before. It was crucial, however, that they fit within the architectural style of the theme park. Moviegoers will see evidence of rides as we progress through Claire and Owen's journey to the bunker in order to activate the beacons. Fan-favorite the gyrosphere is back…and it might just save the day. Lockwood's library was built on S Stage. Resembling a natural history museum, the vast set was filled with archaeological artefacts, dinosaur skeletons and lined with intricate dioramas, which serve as Maisie's playground and hiding place. When filming in the library was complete, the set was re-dressed and transformed into Lockwood's underground garage, which is used by the more duplicitous characters to house a sinister auction room. The eerie dinosaur containment facility, in the basement of the Lockwood mansion, was built on R Stage. This was designed as the holding area for the dinosaurs arriving from Isla Nublar and also housed Dr. Wu's state-of-the-art laboratory and the control room. Stages M and F were utilised to build Maisie's quirky and luxurious bedroom and Lockwood's bedroom. The vast interior of the Arcadia, the cargo ship that transports the dinosaurs from Isla Nublar to their new destination, was built on RA Stage. This set was filled with huge trucks for the scenes in which Claire, Owen and Franklin dive on board the vessel and find Zia working to save Blue's life. When filming on the Arcadia was complete, the set was rebuilt to become the gigantic rooftop of the Lockwood Estate where Claire, Owen and Maisie come face to face with the stealthy Indoraptor. The production also took extra space at Langley Business Centre, a short distance from Pinewood Studios. In order to film scenes at the beginning of the movie"introducing Franklin and Zia to the story"Claire's Dinosaur Protection Group office was built here. Other scenes filmed at Langley included the video of Owen training baby raptors, and the scene in which Claire and Owen must take blood from a heavily (?) sedated T. rex. The largest set build in Hawaii took place at Police Beach (near Papa'iloa Beach). This is where the art department recreated Main Street, complete with destroyed Nobu and Margaritaville. The set took more than three months to build and was meticulously dressed with the aftermath of chaos that took place on the island in the last film. When Claire and Owen first arrive on the island, they drive through this set as they venture back into Jurassic World. Situated on Oahu's windward side, He'eia Kea Pier served as the location of the shipping dock, where dinosaurs are loaded onto the Arcadia as lava spews down the mountainside…and Claire, Owen and Franklin must jump in a truck"joining the cargo to its unknown destination. Picturesque He'eia Kea Harbour is located in Kaneohe Bay, the largest sheltered body of water in the Hawaiian Islands. On a usual business day, the He'eia Kea Harbour offers fishing charters and scenic cruises, boat, water toy and jet-ski rentals, parasailing, snorkel and scuba diving cruises. Just a few moments away from the Pier, is He'eia Jungle, where Owen's trek to find Blue was lensed. During the expedition to locate the beloved Velociraptor, Owen is double-crossed, and left behind to be devoured by dinosaurs or lava…whichever gets to him first.